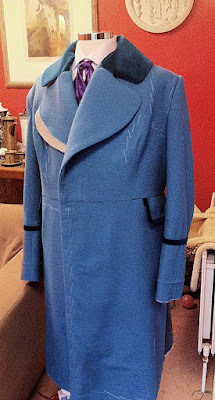 So far on the blue version of the Romana Frock Coat I have been commissioned to make, I have assembled the body and sleeves, and prepared the underside of the lapels with the necessary pad-stitching. 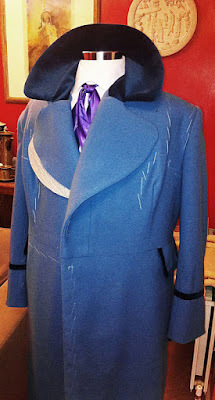 My next task was to create the lining with the lapels and collar attached. Once this was done I could then stitch around the lapels and down the fronts, before sewing around the collar. I paused halfway through just to check the lapels were going in okay, which they were. The collar is designed to lay flat around the shoulders (see right) but is intended to be worn with it raised with the scarf underneath (see below). After this it is the slow plod to completion, with the hemming and sleeve linings to finish it off. I do have the trimming around the lapels and down the front edges to do as well, but this shouldn’t be too much trouble. The coat is starting to come together a look someway finished.